9:00 pm, September 30, 2014. It was dark by the time we finally made it to our hotel and booked in. The night was surprisingly balmy for late September so we left our fleecies at the hotel and ventured out. Our stop was a little ‘cervezeria’ that had been winking at us on our way to the hotel. We plopped down on some chairs on the ‘terraza‘ and ordered a ‘cerveza a presión’ (4 €) and a not very impressive ‘vino blanco de casa‘ (2 €). 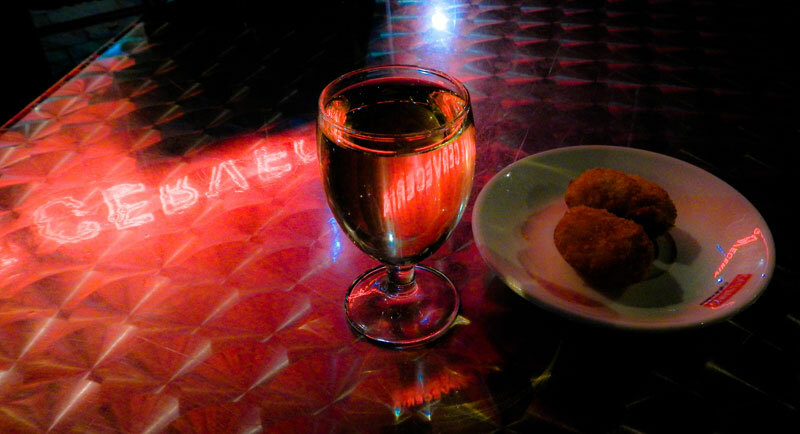 It came with a little tapa of ‘patatas croquetas‘, our first experience of the Spanish snacks that almost always come along with your drinks. When it started to get chilly, we paid our 6 € bill and headed inside where it was warmer. Where we discovered a full tapa bar! 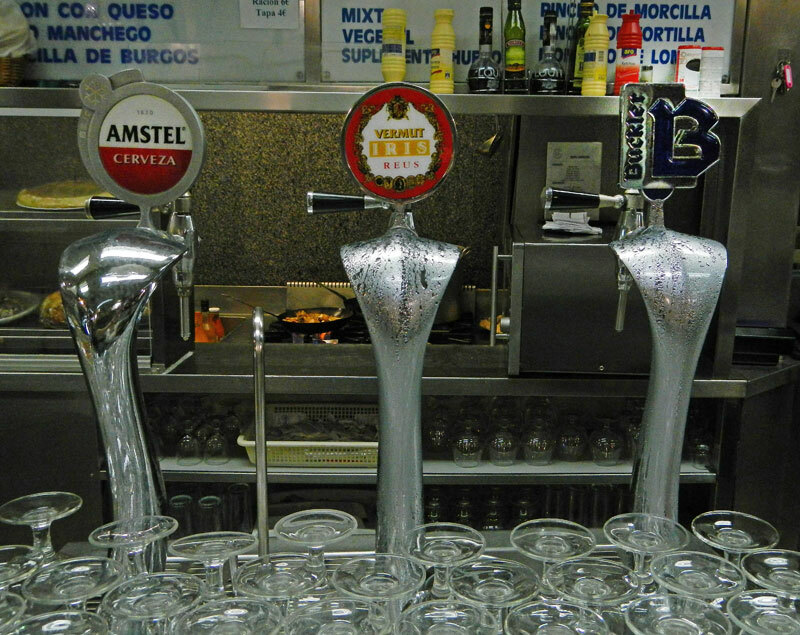 And three beer taps! I ordered another small wine and Al ordered a beer, selecting the middle tap, and asking for ‘un doble‘. The guy poured Al’s beer, a surprising dark red, almost black. A stout? Then the bartender added ice. And a lemon. Al didn’t want a lemon in his beer so he waved it off. Then he took a sip. It wasn’t beer at all – it was vermut. We regrouped. My wine hadn’t been poured yet so I opted to steal Al’s vermut (and I will have a limón with that thank you very much) and Al had a doble of the Amstel presión. More tapas arrived: olives so suave they melted-in-your-mouth. This time the bill was only 4.50 € – way cheaper than sitting outside, and when we checked the posted menus we discovered that it costs more to eat and drink outside on the terraza. This holds true in many of Madrid’s drinking and eating establishments, and is something to keep in mind if you’re on a budget. More on our October 2014 trip to Spain.